You may have heard about the rain we had last week…actually, it was ten full days! We were fortunate not to experience any flooding at the Inn, and while the Blue Ridge Parkway closed for a couple of days for workers to clear the roadway of any fallen trees, it is back open and offering great views of fall foliage at elevations between 3,500 and 4,500 feet. Right above where the waterfall wraps around a cut in the rock and plunges downward is an observation area along the main hiking trail, so that gives you an idea of the size of this waterfall. Amazing, right?! Mt. 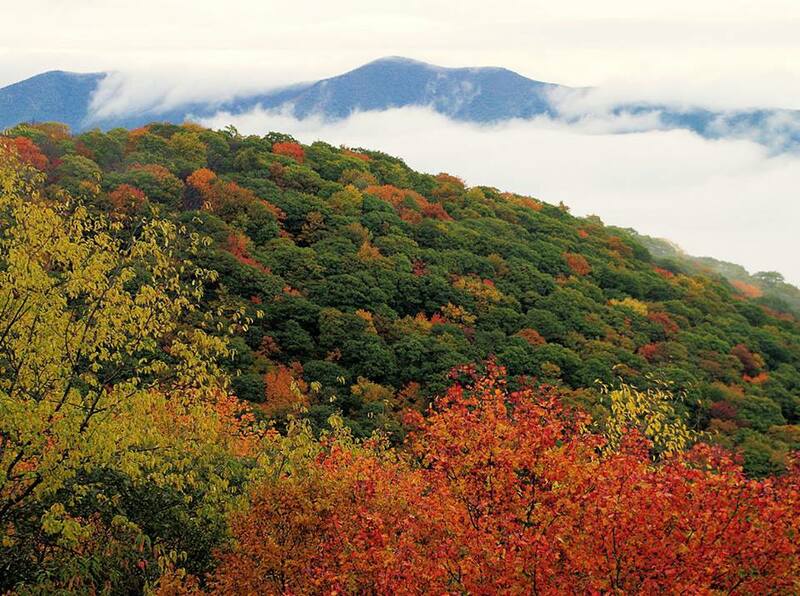 Pisgah and Graveyard Fields: Last week, we mentioned Graveyard Fields, which is southwest of Asheville on the Blue Ridge Parkway at Milepost 418.8, and word on the fall color street is that the area will be reaching peak by the weekend of October 9-10. That is right on schedule based on previous years. If Graveyard Fields is super crowded — not unusual this time of year — try the three-mile roundtrip hike to Mt. 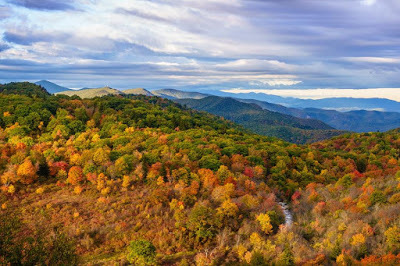 Pisgah (located closer to Asheville at Milepost 407.6), and take advantage of near 360-degree views from 5,000 feet. Craggy Gardens north to Highway 80 via the Blue Ridge Parkway: Craggy Gardens, a beautiful section of the Blue Ridge Parkway north of Asheville at Milepost 364, overlooks the town of Black Mountain. Its huge swaths of rhododendron attract hikers in the springtime. It’s also known as a great spot to catch some fall color in sweeping vista views of lower elevations, even when the “Craggies” themselves are past peak after early October. We recommend hiking the Craggy Pinnacle Trail, which offers panoramic mountain views at the top. If a lot of people are at Craggy Gardens, try the Bald Knob Ridge Trail a little further north on the Parkway at Milepost 355. From Craggy Gardens, head north on the Blue Ridge Parkway past Mt. Mitchell, then turn right onto Highway 80 south, a very scenic (and curvy) road that we like to call a mini-Blue Ridge Parkway. 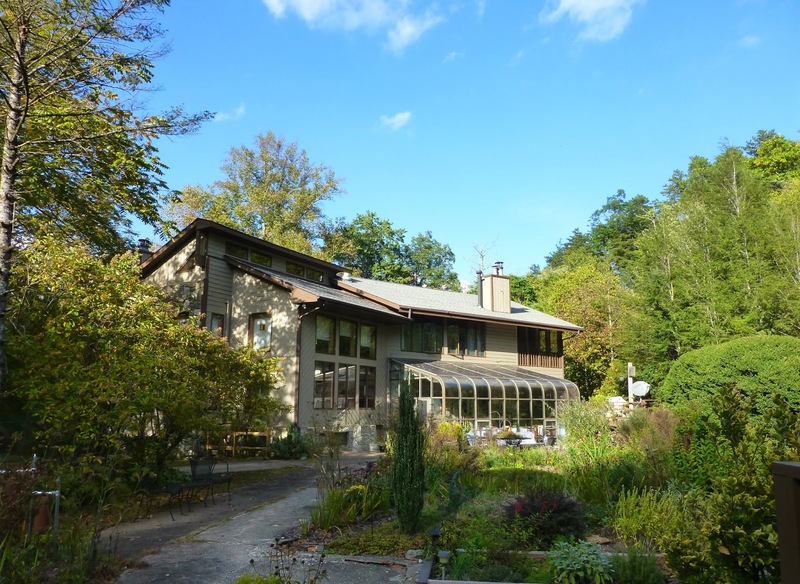 Highway 80 will bring you to Highway 70, which you can take west back to the Inn on Mill Creek B&B. 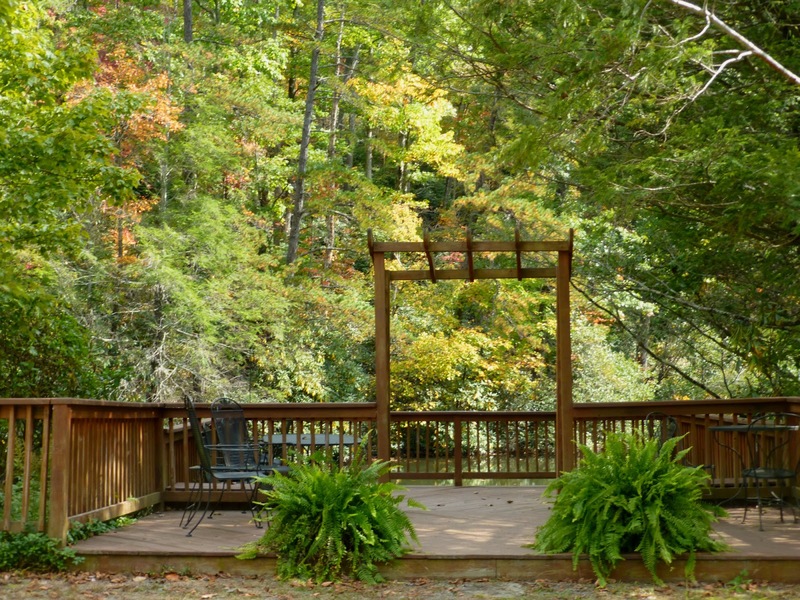 Lookout Mountain in Montreat: Bordering the town of Black Mountain, NC, to the north is the community of Montreat. 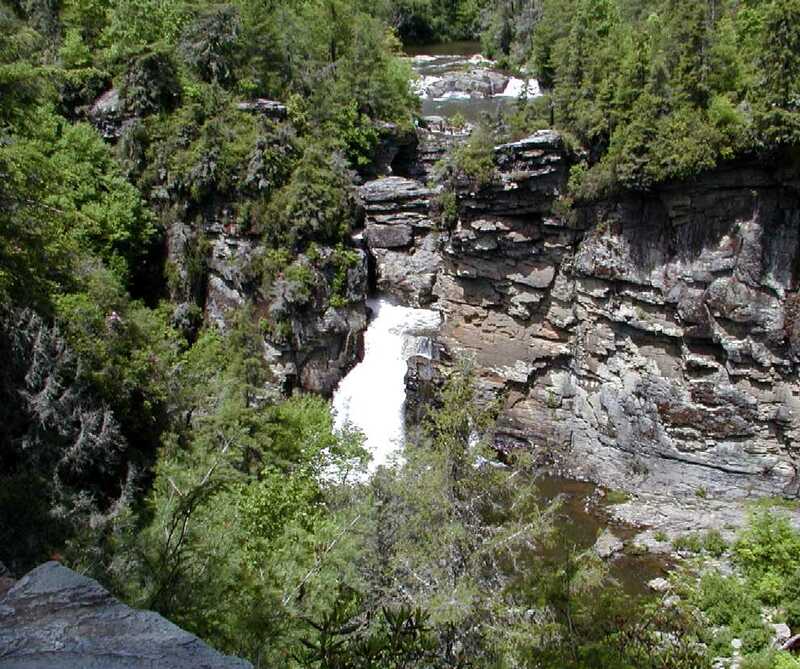 It’s a spectacular area for hiking, with several trails of differing levels of difficulty. A popular trail is Lookout Mountain, a moderate trail over a half-mile long that takes you up in elevation to a rocky outcropping at about 3,600 feet (below the actual summit), looking down on Montreat and Black Mountain. The summit of Lookout Mountain does not offer the same views, but does provide the option of continuing on one of the other Montreat trails beyond it. Linville Falls and Chestoa View: You saw that photo of Linville Falls above, right? It’s pretty spectacular even without all the rain we had. The area is quite colorful in mid-October, and the hike to the falls is a good one. If it’s a weekend, you might run into larger crowds, so a typically less crowded (non-waterfall) alternative is the Chestoa View Trail just south of Linville on the Blue Ridge Parkway headed the direction of Asheville. 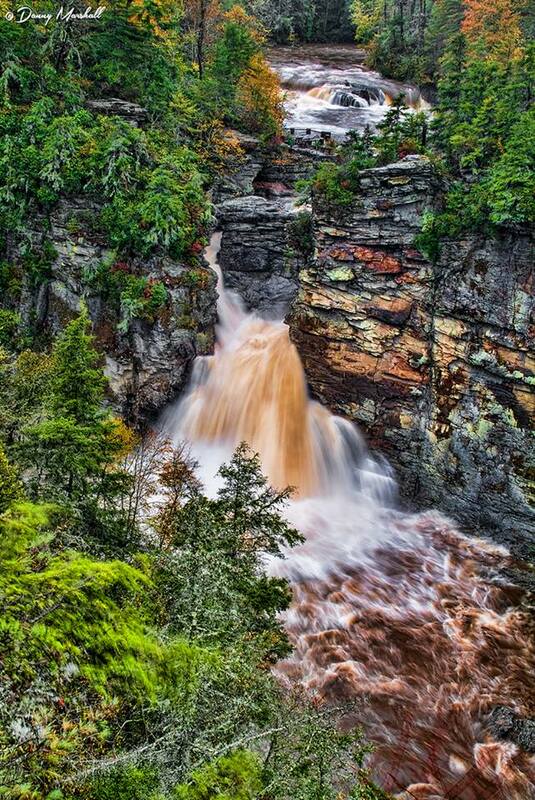 The views of Linville Gorge from the trail are amazing. So what’s happening in terms of fall color in our neighborhood? Here at the Inn on Mill Creek B&B inside Pisgah National Forest (2,300 feet), the color is much further along than in previous years — a nice surprise! — but fear not, late October guests, there is still a lot left to go. 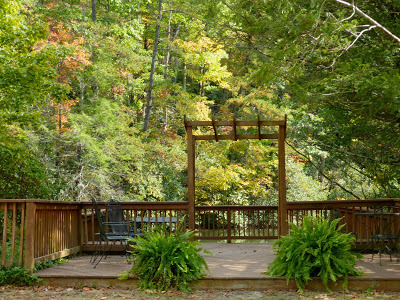 The arbor deck at the Inn on Mill Creek…relaxing! The dogwoods and sourwoods are doing major fall color duty, as are hickory, sassafrass, birch and beech. The tulip poplars once again (5th year in a row) ask us to keep our expectations low as they fade into bronze yellow and then quickly brown. At least they’re providing good “leaf crunching” on the ground, always a nice fall sound! Maples are just getting started and were perhaps delayed a bit by the rain, so we are expecting some nice color out of them later in the month. We’ll see you next week! Until then, for even more fall color reports, check in with our friends at RomanticAsheville.com and Blue Ridge Parkway Daily. 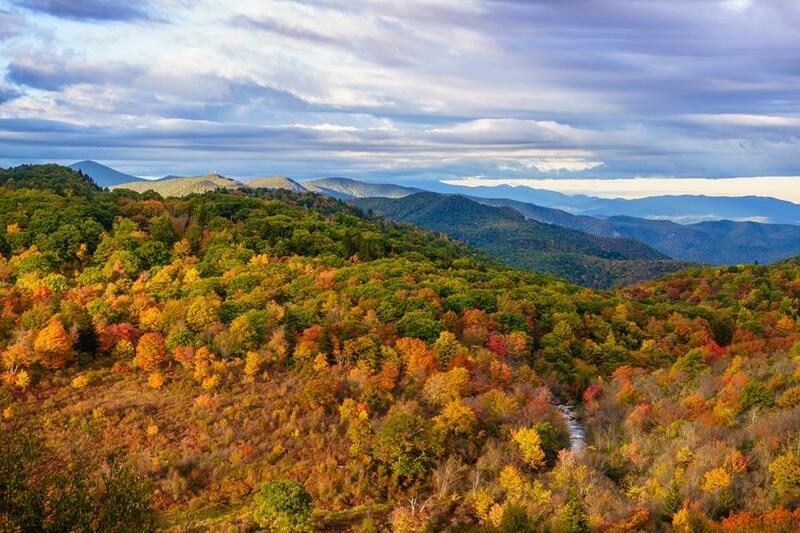 This entry was posted in Fall Color Reports and tagged Asheville, Blue Ridge Parkway, fall foliage, hiking by Inn on Mill Creek. Bookmark the permalink.